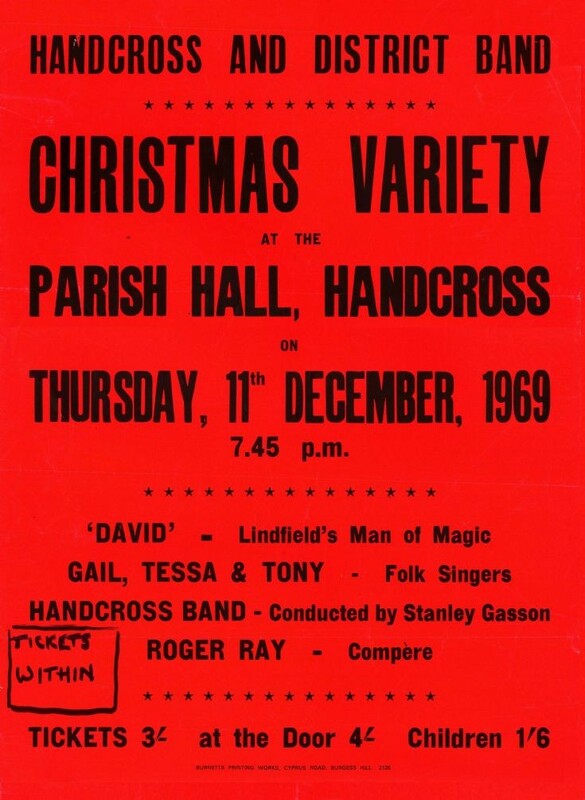 The Handcross band put on a Christmas Variety Show during December 1969 and my father, Roger Ray, decided to try and record some of the show on his old reel-to-reel recorder. A programme of the evening’s performance can be seen by clicking on Open Document. The whole audio is quite long at 40 minutes, and I have divided it into two. The second half can be heard with picture #1249. The first half is 19 minutes long, and if you decide to skip forward, at least listen to my father working his socks off at 8.50 and catch everyone by surprise when he launches into song. Use the controls below to hear what the good folk of Handcross got up to in the Parish Hall in the 1960s.